The sitemap index includes links to a variety of sub-sitemaps for posts, pages, authors, categories, tags, and other taxonomies. The sitemap index can be customized under SEO > Search Appearance. Posts, pages, and other custom post types can be customized under the 'Content Types' tab. 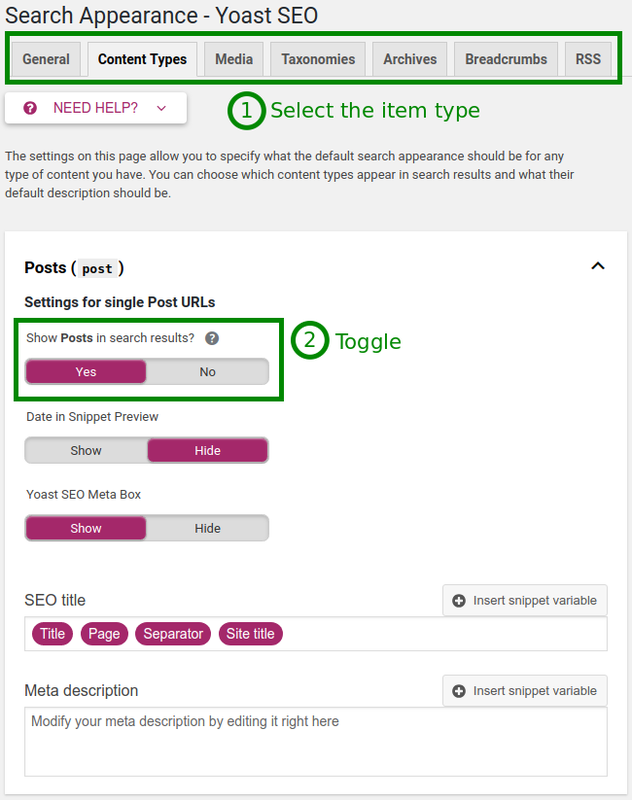 Removing a post type from the search results will also remove them from the sitemap. Showing them in the search results will show them in the sitemap. Add or remove items as needed. 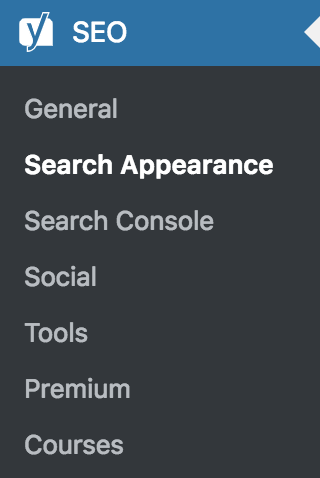 Click on the appropriate tab and toggle Show [type] in search results? to add or remove sitemaps. Yes: [type] will be set to index and a sitemap will be created. No: [type] will be set to noindex and a sitemap will not be created. Some content types are not added publicly and thus do not appear for exclusion. When this occurs, the post type can either be made public or manually excluded using a developer filter. You can also remove individual post types from the sitemap by marking them with a noindex tag. Use this guide if you are not sure how to do that: How do I Noindex Urls? When you upload an image, WordPress automatically creates a post of the type "attachment" in the database, and the corresponding URL for that. It calls this the "media" post type. Learn more here. Categories, tags, and other taxonomies can be customized under the 'Taxonomies' tab. Some taxonomies are not added publicly and thus do not appear for exclusion. When this occurs, the taxonomy can either be made public or manually excluded using a developer filter. Our plugin creates a sitemap that lists the author pages. Learn more about customizing the author sitemap for single author websites or multiple author websites. Our Video SEO plugin sitemap can be customized under Admin > SEO > Video SEO. Our News SEO plugin sitemap can be customized under Admin > SEO > News SEO. Our Local SEO plugin sitemap is generated based on the location data entered into the plugin. You can add non-Yoast sitemaps to the index. Please read this article for more information. Below are a few examples using the developer filters in your functions.php file to customize the sitemaps. If you are not familiar with implementing code in WordPress, we highly recommend checking out Code Poet as they have a great list of available freelance WordPress developers. You may also wish to review a Yoast Partner. You can change the number of entries per sitemap by using the filter below. The default number is 1000. Please refer to this GitHub Comment for how you may best integrate dynamic URLs.